Hello everyone! Here I share a brief summary about the importance of knowing solar thermal energy and how we can use it for drying purposes. 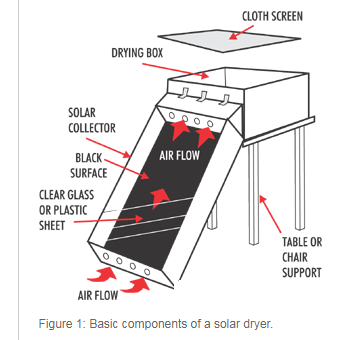 Solar dryer based on thermal energy storage materials is quite effective for continuously drying agriculture and food products at steady state in the temperature range (40 °C–60 °C). Such dryers have globally become a potential viable substitute to the solar dryers based on fossil fuel, due to the utilization of clean energy resources and cost-effectiveness. Storage materials utilized in these dryers can store energy during the sunshine hour and deliver the stored energy during off-sunshine. It reduces the existing load on the gap between energy demand and supply, hence plays a vital role in energy sustainability. A number of studies have been done in last few decades for drying agriculture and food products with a solar dryer based on thermal energy storage concept. This paper mainly presents a review on the important contributions made so far in the field of solar drying systems based on the thermal energy storage medium, with a focus on recent updates in thermal energy storage technology available in terms of materials capable of storing heat as sensible and latent heat. Solar energy defuses in the nature and provides low grade heat. This characteristic of solar energy is good for drying at low temperature, high flow rate with low temperature rise. Worldwide, there is huge demand of efficient solar dryers utilized by various food and agricultural products. Solar energy based solar dryers are not only cost efficient but also can be used across the globe, specially contributing to cleaner energy resources. Novel system designs and techniques related to solar dryers are being explored to increase the efficiency and performance of solar dryers, which could in turn be much more commercially utilized by the end user. Phase change materials can store energy during sunshine hours and retrieve during off-sunshine hours for drying purpose, hence solar dryers embedded with such materials could be quite useful. • Latent heat storage materials that can be used for solar drying are summarized. • Types of thermal energy storage are pointed out for drying systems. • Developed solar drying systems with sensible and latent heat storage are described.